Many years ago, on social media, a friend posted a picture of a place she went to for dessert while in Las Vegas. The picture was drool-worthy, and I was in heaven. I was determined to check this place out because I am, after all, the queen of desserts. The irony of it all is that many years later, and multiple trips to Las Vegas later, even though I’ve planned many times to go to this particular place, I’ve never actually made it there for one reason or another. Fast forward to our last day in Boston, we’re about to get on the plane in a few hours and head home from our quick holiday getaway. My husband and I decide we need to find lunch somewhere because this will be our last meal for a while, so we walk around trying to see if we can come up with a place we both agree on. Lo and behold, what do we see? The same restaurant I’ve been wanting to go to in Las Vegas is here, in Boston. My husband says it must be a sign, and since I’ve been wanting to eat here, we might as well eat here. 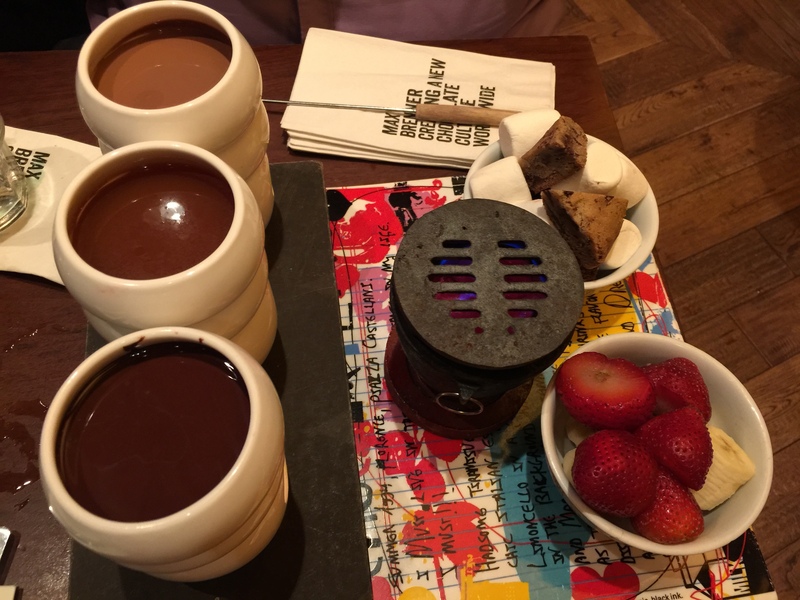 Chocolate by Max Brenner is a food concept that incorporates both sweet and savory items which help customers immerse themselves in a chocolate experience. As a chocolatier, Max Brenner got his start in Israel in 1996 where he opened up a chocolate shop. That shop soon grew into 10 shops. 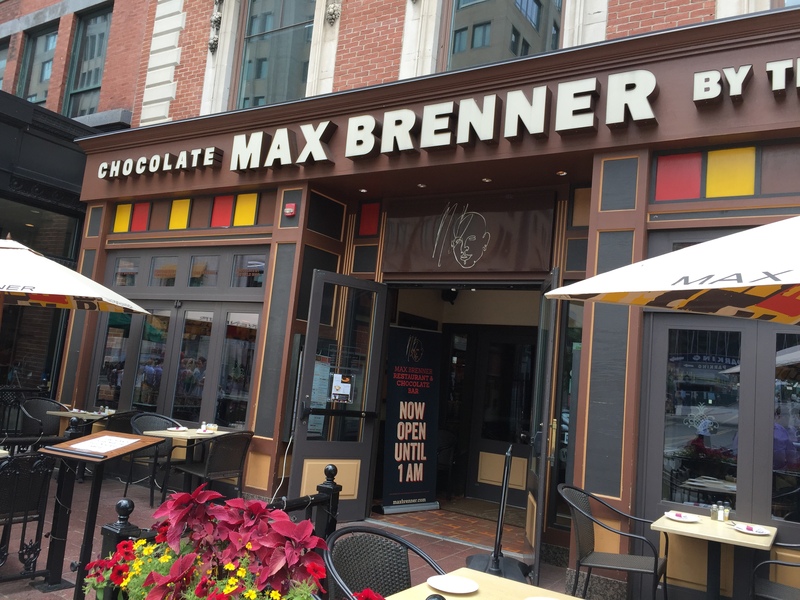 In 2000, the Max Brenner brand grows to a chocolate bar in Australia. In 2006, the first location is opened in the United States in New York, and it soon expands to Philadelphia, Boston and Las Vegas. 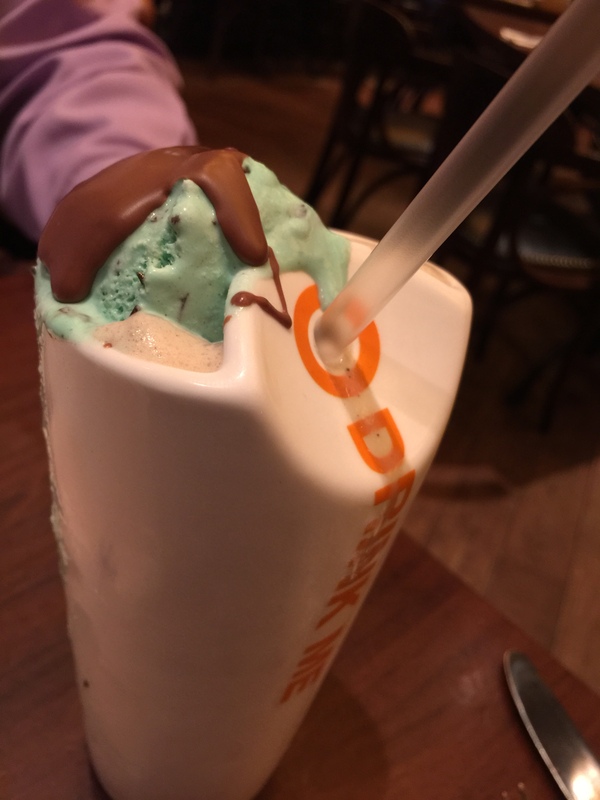 Max Brenner is “creating a new chocolate culture, a chocolate sensory immersion that encourages you to open your mind about how you connect with chocolate.” Chocolate as the central theme around which a restaurant concept is built? How could you not like that? 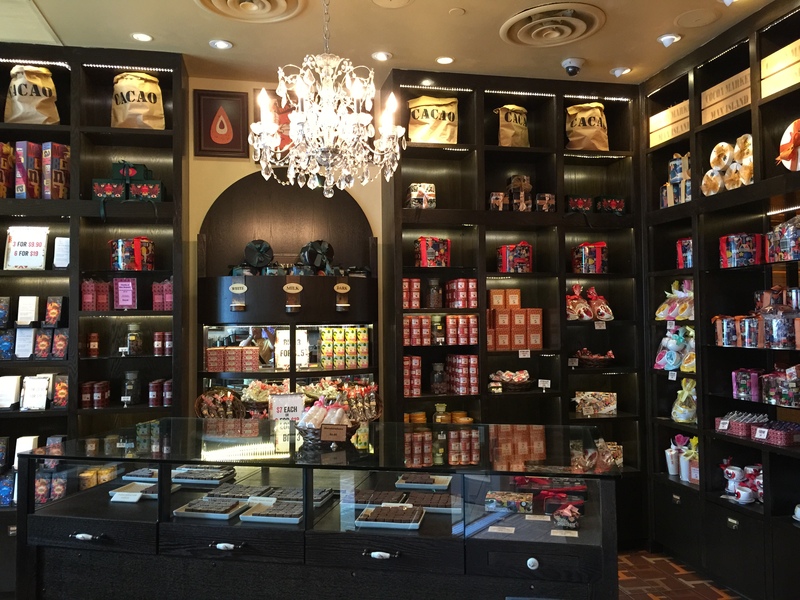 When you step inside the store itself, everything is chocolate-themed as well. It almost feels like you’re stepping into a chocolate laboratory with glass bottles lining shelves filled with white chocolate, dark chocolate and milk chocolate powder and bars and liquid chocolate. Everything inside the store makes you drool, as if you weren’t already drawn into the store by the promise of chocolate! To drink, I decided to order a frozen lemonade with the addition of mango. Cool, and refreshing on this warm, summer day. It is the 4th of July weekend after all, what a better way to celebrate summer than with a frozen lemonade. 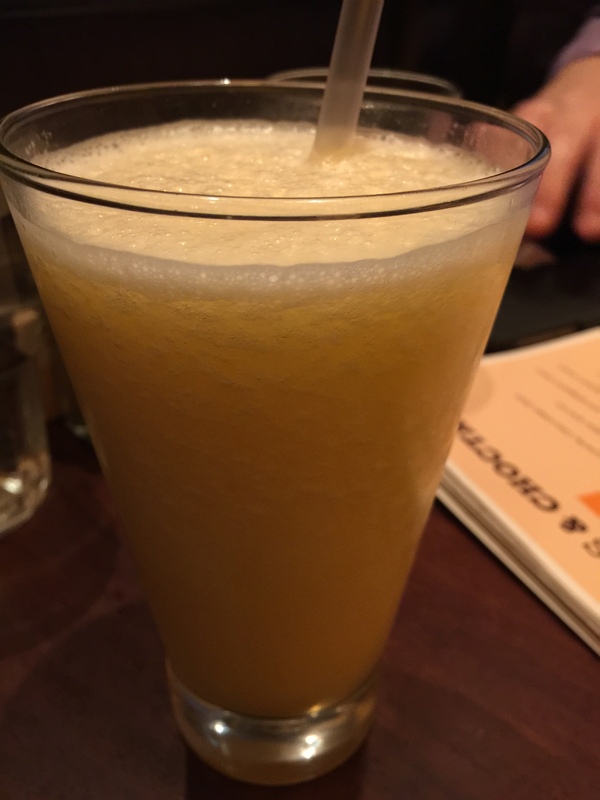 Using lemonade blended with ice and the addition of mango puree, the drink was delicious. A little sweet from the mango and a little tangy from the lemon, it was the perfect summer treat. My husband decided to go with a really decadent drink, er dessert-drink? He ordered Max’s summer mint chip cocktail. 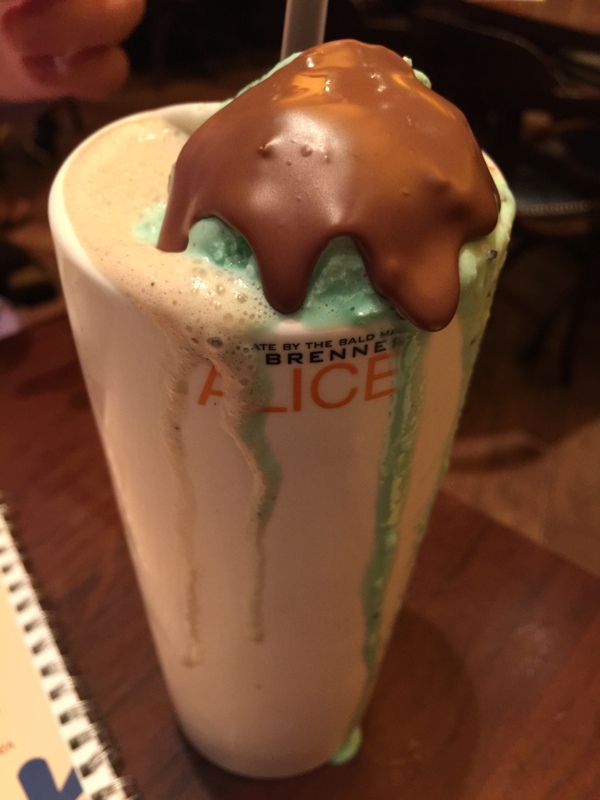 Made with mint chip ice cream and then blended with chocolate ganache and ice, the drink is then topped with an extra scoop of ice cream and a crunchy chocolate shell. The best part of the drink, it’s served in this really adorable ceramic milk carton with a hole for the straw. It was the cutest thing. I want one of those. This was like a milkshake, but without the milk. Instead, there’s the addition of the chocolate ganache and the ice to make it frothy and thick and cold. My husband loved it. The scoop of ice cream on top with the chocolate shell, but the flavors of the cocktail itself, he thought were terrific. It was a little chocolatey and sweet, but yet, it had that mint flavor and taste, but it wasn’t too strong and too minty. A cocktail and not a milkshake, something different, but yet delicious. He said it tasted great, and I was a little envious watching him drink it up. 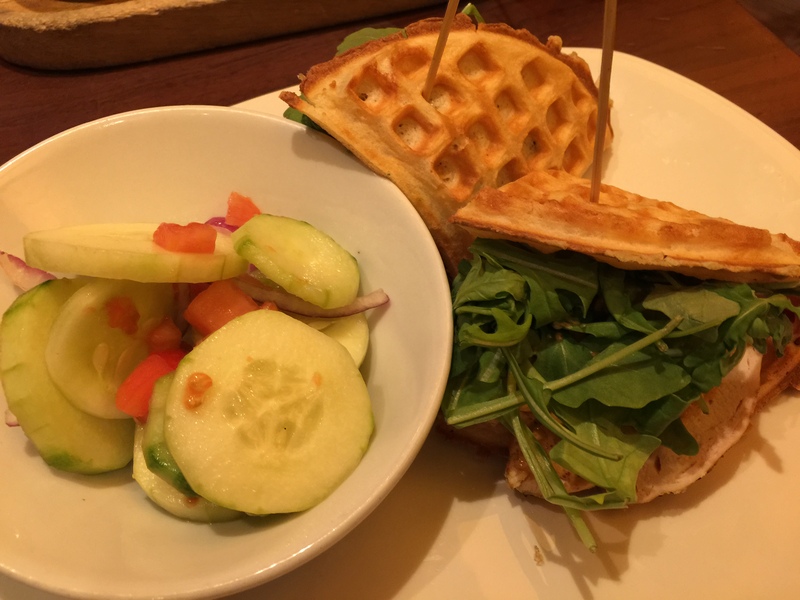 For lunch, I decided to order one of Max Brenner’s cold sandwiches served on a house made rosemary-infused waffle. Each cold sandwich came with a side of fresh tomato & cucumber salad. My sandwich of choice was the grilled chicken caesar sandwich. I’m a chicken caesar salad fan to begin with, and I really enjoy waffle sandwiches, so this is kind of the combination of both together in one. Made with freshly grilled chicken and topped with melting mozzarella, red onion arugula, asiago crisps and caesar dressing, this was a unique and different sandwich. 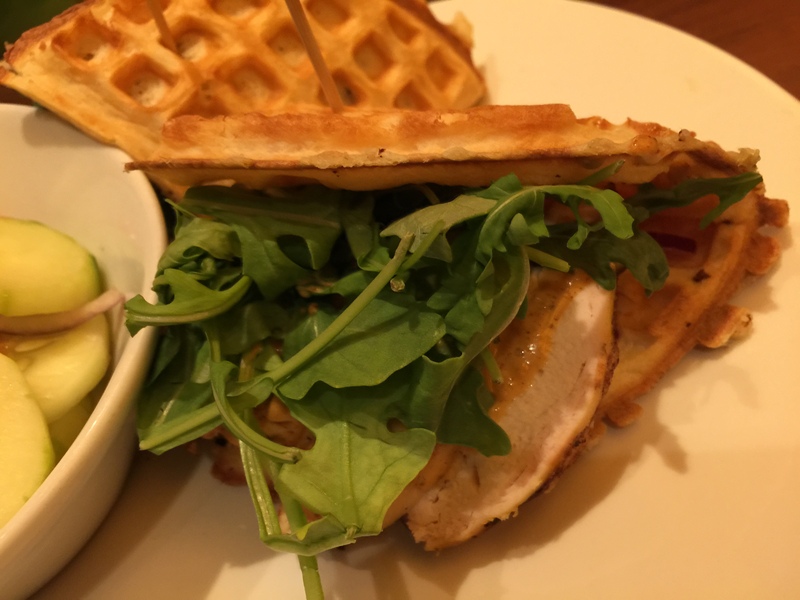 First off, I liked the waffle, it wasn’t overcooked and crunchy, but more soft and chewy so that it held up well to being stuffed, essentially, with the sandwich ingredients. The flavor definitely was that of a caesar salad with the caesar dressing and the chicken, but the addition of mozzarella cheese and the arugula was different. I liked the nice peppery flavor of the arugula and the crunch and crispy of the asiago chips. I have to say that the melting mozzarella was a bit different and I’m not sure I loved it. I don’t necessarily think that mozzarella and caesar salad go that well together, so having it on this sandwich was different and I probably would have preferred my sandwich sans mozzarella. I loved the concept of the sandwich and it was quite good, but it wasn’t over-the-top fantastic. 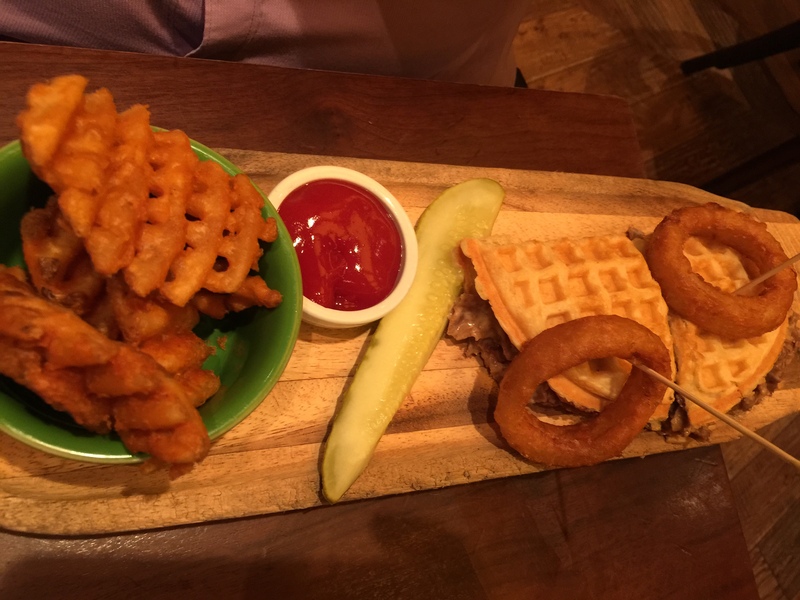 My husband went with a hot sandwich made on a house made savory waffle. 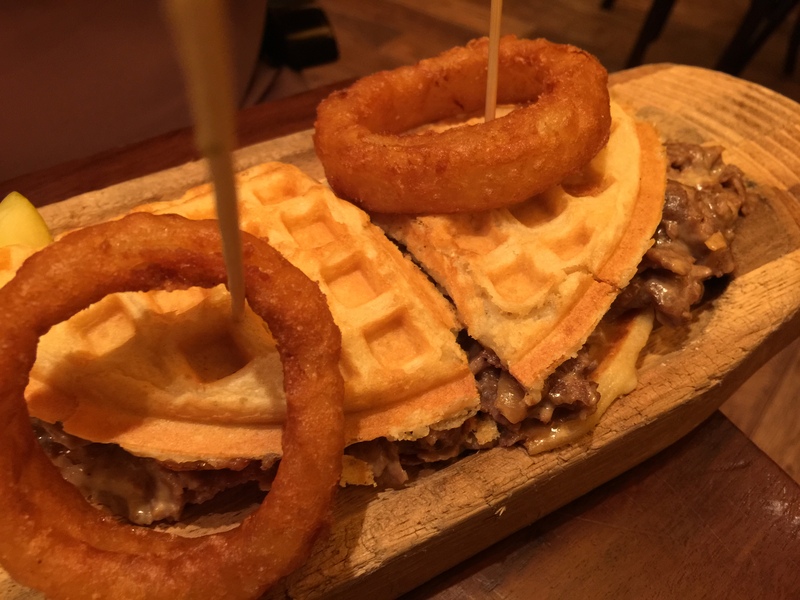 His sandwich of choice was the cheesesteak waffle sandwich with thinly-sliced sirloin, caramelized onions and Max’s special 5-cheese sauce. This was all served with waffle fries and a pickle. My husband really liked his cheesesteak. He thought that the steak was cut up nice and thin and had great flavor. The 5-cheese sauce was terrific and really made the sandwich. And of course, the waffle fries, generally not a favorite of my husband’s but they actually weren’t too bad. He was actually quite surprised how much he enjoyed the meal itself because he figured this was strictly a dessert-type establishment and that the food was just a throwaway option. But it turns out that the food itself was pretty decent. We couldn’t however leave Max Brenner’s without get a dessert to sample the amazing chocolate he’s known for. So, we decided to order the classic European fondue for two. Served with bananas, strawberries, chocolate chunk cookies, marshmallows and fluffy chocolate sponge cake, you get your choice of two towers of melting chocolate and toffee sauce. This was decadent and amazing, but surprisingly, not that filling, which was good. 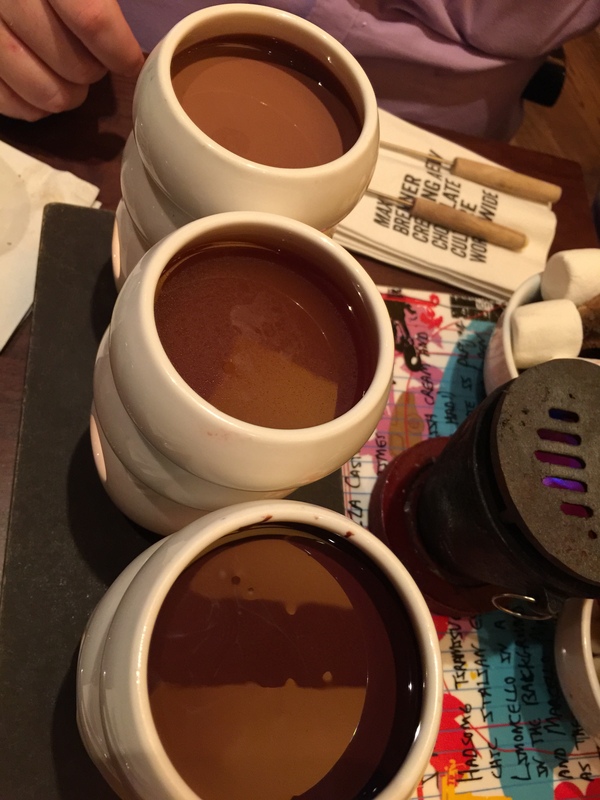 We had ordered as our two melting chocolate flavors dark chocolate and white chocolate, but somehow our waitress didn’t get our order correctly and we got dark chocolate and milk chocolate. It’s ok, not that big of a deal. So you get this little miniature campfire stove that is lit for you and you can use the skewers provided to stab some marshmallows and try to melt the marshmallows over the little stove. Realistically, it’s a bit more gimmicky that actually being functional as trying to melt anything on a stove that tiny was a bit impossible. The melted chocolate was luxurious and delicious and the toffee sauce that came with the fondue was actually quite good as well and a good compliment to the rich chocolate. Much like fondue at The Melting Pot, you’re supposed to stab all of the accompaniments on your fork and then dip it into whatever chocolate sauce you want to coat your fruit or cookie pieces in. My favorite was the dark chocolate, as was my husbands. While it looks like a big dessert, those chocolate towers you see are actually only half filled with chocolate, so it’s not really that much chocolate sauce. And I must say I was a bit disappointed that even in the middle of summer, the strawberries we got were frozen strawberries rather than being fresh strawberries, which would have been much better. But nevertheless, a cute, fun dessert. Max Brenner’s while a bit gimmicky overall, turned out to be a much better experience than my husband or I thought it would be. The food itself that we ordered was way better than we had expected it to be, and the desserts were fun and chocolatey, as they should be. I won’t say its the best chocolate dessert I’ve ever had, because I’ve had better. 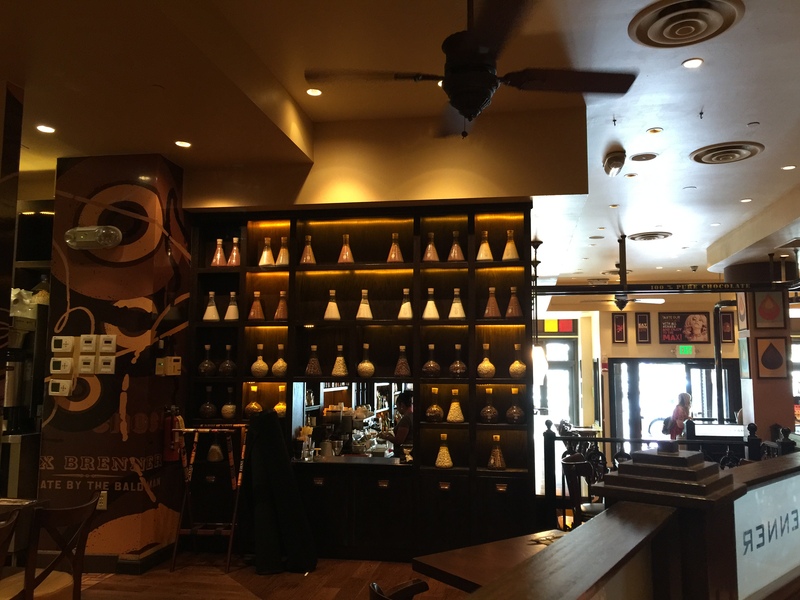 But as a concept store, Max Brenner’s pretty much delivered what I expected it to deliver. 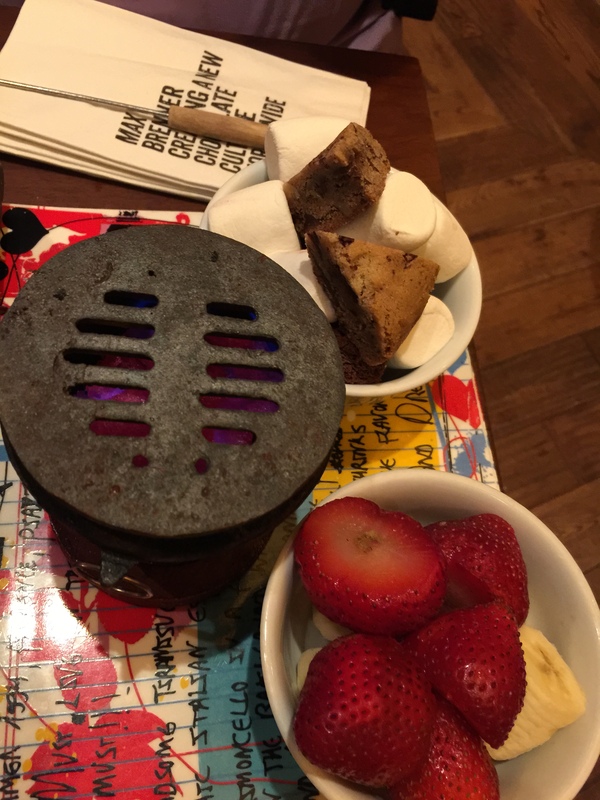 I’m certainly glad that after having passed up the opportunity in New York or Las Vegas to visit Max Brenner’s that I finally got my opportunity to do so in Boston. This was a fun way to end an amazing long weekend vacation.